If you’re looking for some ways to get out of debt and save some money also, then this article is just for you. Inside of article, you learn money saving tips you can use to save money so that you can pay off your debts faster. All of these tips are things that I do myself, so you can benefit from my personal advice. Did you know that clipping coupons can help you to save tons of money? It’s true, and it’s something that more people should spend time doing in today’s economy. Clipping coupons could save you thousands throughout the course of a year, and you can benefit from the great deals that you find. All of the valpak coupons that you get on a weekly basis can be of some good to you. All you have to do is uses those coupons to save big on items that you need for your home. If you’re someone who is ashamed of clipping coupons, then when you’re at the checkout line, simply think about how you can re-purpose those savings to pay off all of your debt. Buying in bulk ensures that you’ll get your favorite items at a discount. If you aren’t so already, you should sign up for a membership at Sams Club or Costco. At these places you can get your favorite items at deep discounts and use those savings to pay off your credit card bills. You can even use this principle when shopping online. There are a ton of retailers that will allow you to purchase from their website in bulk, so consider this also when buying online. Putting away loose change can add up to serious money at the end of the month. 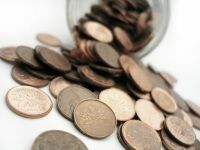 By putting away excess change that you get from stores, you could save up an extra $40-$80 a month just by change alone. This is something that I still do today to save and pay off my debt. You should do the same to so that you can have extra money at the end of the month. By putting 10% of your weekly check into your bank account you ensure that you’ll definitely have money at the end of the month to pay off your debt. This is a good habit to develop anyway so that you can extra money to use when you need it. It doesn’t matter if it’s a few dollars or even a few hundred, all of this extra money will come in handy when it comes to paying off your debt. These 4 money saving tips will prove to be handy when it comes time to pay off your debt of every month. It doesn’t matter if it’s only enough to pay the minimum balance. Paying the minimum balance is better than not paying at all, so you should take advantage of these money saving ideas. Good luck with paying off your debt. About the Author: Learn how to become debt free and live a life full of financial freedom. To learn more, visit the following website for more details.